The drama of a teenage romance is so well-trodden that we could put it in a shop window on display, and no one would look twice. But if we animate those figures, I bet you couldn’t help but stop and stare. Tomomi Mochizuki, sometimes incorrectly romanized as Tomomichi Mochizuki, is an anime director and producer. He is married to animator Masako Gotō and sometimes uses the alias Gō Sakamoto. Known for Ranma ½, Kimagure Orange Road and the Studio Ghibli movie Ocean Waves, he recently worked on the House of Five Leaves series. I haven’t seen a lot of his previous work, but I’d definitely heard of Ocean Waves before, and as Studio Ghibli movies are generally well received, I thought I’d give this previously unreleased film a chance. To be clear, it was never released in North America, but it did come out in Japan. 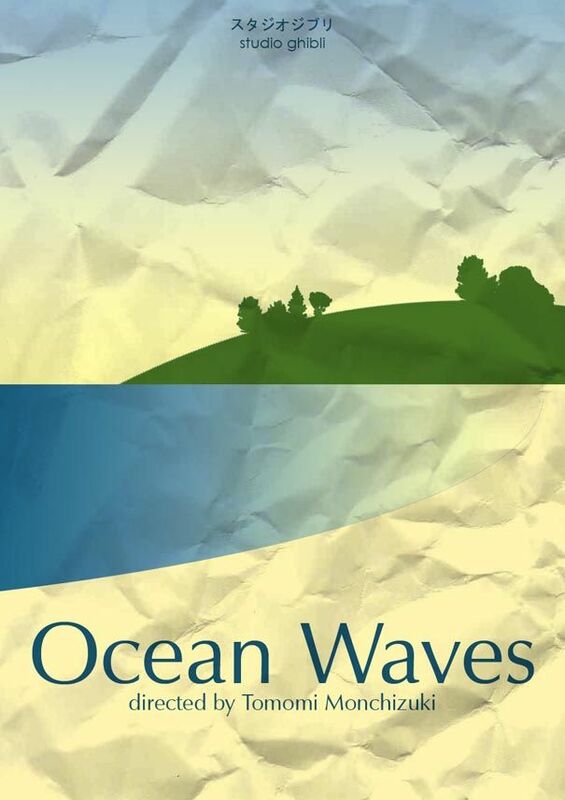 Put together by younger studio Ghibli team members in the hopes of producing a cheaper film, Ocean Waves tells the story of a love triangle that evolves between two friends and a new girl who arrives to their high school. It’s been fairly reviewed since released in North America, but this film is not dubbed, so prepare to do a lot of reading while you watch. At an airport in Tokyo, Taku Morisaki glimpses a familiar woman on the platform and we go into their backstory. Two years prior, Taku receives a call from his friend, Yutaka Matsuno, asking to meet at school. He finds Yutaka at a window, watching an attractive female transfer student whom Yutaka was asked to show around. The boys discuss their upcoming trip to Hawaii. Taku is introduced to the new girl, Rikako Muto. She thanks Yutaka for providing directions to a bookstore. Taku teases Yutaka about his infatuation. Rikako is academically gifted and good at sports, but also arrogant. Taku believes she is unhappy about leaving Tokyo and learns she is living away from home. His mother learns from gossip that a divorce brought Rikako’s mother to Kōchi. The school year ends, heralding the Hawaii trip. When prompted, Taku loans Rikako ¥60,000. Promising to repay him, she warns not to tell anyone. But Yutaka witnesses this, and is visibly upset. Later, Rikako chews Taku out for telling Yutaka about the money, saying that he also loaned her ¥20,000. When third year begins, Rikako has a new friend, Yumi Kohama. Rikako hasn’t returned Taku’s money, but at one point a distressed Yumi calls Taku, explaining that Rikako had tricked her into coming to the airport on the pretence of a concert trip, only to discover that their real destination is Tokyo, tickets paid for with Taku’s money. He races to the airport deciding he will accompany Rikako instead. We learn that Rikako has visited her father unannounced. Her father thanks Taku, repays the loan and arranges a room at a hotel. Rikako explains that she used to side with her father, but had now discovered he wasn’t on her side. Taku comforts her, offers his bed and sleeps in the bathtub. The next morning, Rikako is back, kicks Taku out to change, and meets a friend for lunch. Taku wanders around the city. After catching up on sleep at the hotel, Rikako asks Taku to rescue her from a former flame. Returning home, Rikako ignores Taku, but doesn’t hide their sleeping arrangement. Taku discovers this from Yutaka, who had earlier confronted Rikako to confess feelings for her, but had been turned down. Taku confronts Rikako about it… She responds by slapping him and he slaps her back. Later in the year, Rikako has alienated herself from many of the girls, with one even accusing her of flirting with a boyfriend, to which Rikako defends herself. Taku comments that he is impressed with her response, but she slaps him. Then Yutaka confronts the confused Taku, but instead of helping, he punches Taku to the ground and walks away. Back in the present, Taku’s plane lands and Yukata has decided to pick up, explaining he punched him because he’d realized Taku had hidden feelings for Rikako to protect him. At the class reunion Taku learns that Rikako was the woman at the station, and that Yumi had run into her too. Yumi tells Taku that Rikako couldn’t make it to the reunion but that she really wanted to meet someone from school that slept in bathtubs. In Tokyo, Taku sees Rikako once more, but this time runs to her, realizing that he had always been in love with her. It’s a short movie for sure, coming in at about an hour and 15 minutes, but like all of the master works of Studio Ghibli, this is a thoughtful and unassuming look at teenage years, as well as unrequited love. It’s subtle, simple, and sometimes boring, to be truthful, but as an animated feature, it manages to do the right things to pull on you. Pros: The feelings of these teenagers are ever changing, and you can’t help but going through the same waves of emotion right along with them. An excellent depiction of the seeming beauty of teenage years, told in the same banal way that it actually unfolds. Cons: If it weren’t animated, how engaged would we really and truly be with this story? And was it necessary? Points of Interest: This is the shortest Studio Ghibli film ever made. Though it was supposed to be made cheaply as it was crafted by young team members, it actually took longer and cost more than planned. You definitely need to pay close attention to appreciate this story, because there are no fantasy elements to keep your interest, but the characters are details, the scenery changes are beautiful, and the mood as generated by the music, is quite lovely. Did this film change the face of Studio Ghibli upon release? Well no, but I have this theory that if they could make something as common as high school love triangles interesting back in the 1990s, it’s no wonder they have been able to produce works like Spirited Away, Howl’s Moving Castle and Ponyo since then.